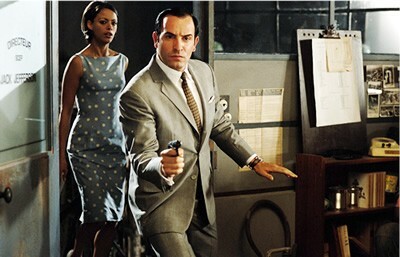 Before The Artist, French director Michael Hazanavicius, actor Jean Dujardin, and actress Berenice Bejo collaborated on the goofy, highly enjoyable spy spoof OSS 117: Cairo, Nest of Spies (2006). Music Box Films, the distribution company affiliated with the Lakeview theater, brought the movie to the U.S. in 2008, and the theater revives it Friday and Saturday at midnight. As noted in our long review, the movie first opened in Chicago alongside the Steve Carell remake of Get Smart and easily bested it. A trailer follows.